A pack of 4 Ramadan Mubarak greetings' cards for $12.50/£8-ish. 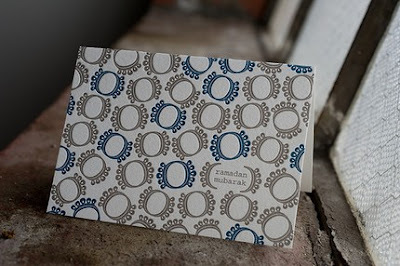 These are nice - a textured grain card with the Muslim greeting 'Ramadan Mubarak' to mark the occassion of a month of fasting. I've bought from Muslamb in the past so I can assure thee that whatever you buy from her, it's top notch sophisticated quality with matching packing and freebies and everything! What dyu think?